Konami invite you round for another sweat-fest in DDR Hottest Party 2, exclusively for Wii. 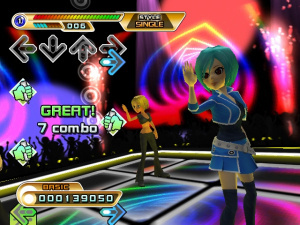 DanceDanceRevolution® celebrates its 10th anniversary with an all-new game for the Wii! The hottest selling dance game returns, with an entirely new soundtrack, game modes and interactivity. DanceDanceRevolution® Hottest Party 2 enhances the series’ trademark interactive gameplay by combining the physically engaging, innovative and easy-to-pick-up-and-play mechanics of the Wii platform. DanceDanceRevolution® Hottest Party 2 is sure to be the life of the party with 4 player multiplayer, Wii Remote and Nunchuk support, smash hits taken from the last 4 decades of music, entirely new modes and more!